Learn the importance of proper riding apparel starting with under layers, eye protection and headgear along with boots and outer layers; gear to pack including personal items, safety equipment, tools, and emergency kits; good trip planning practices; towing a trailer; common laws; and a pre-ride checklist. A section quiz is provided. 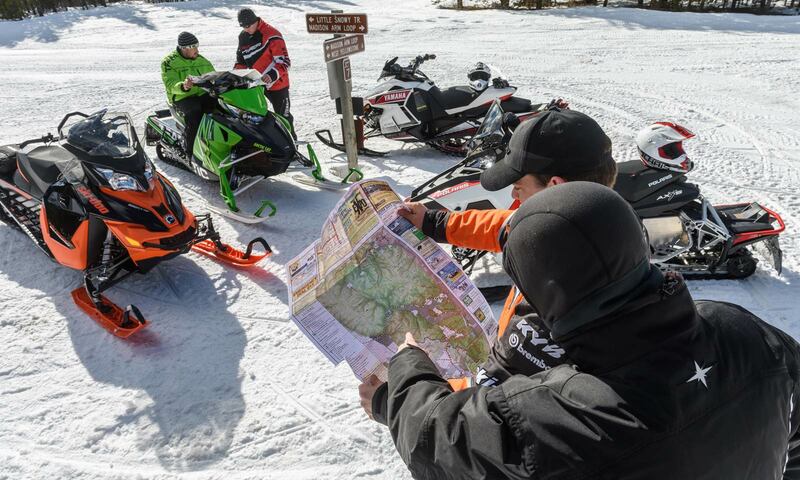 You need proper apparel and gear to ensure your snowmobile outing is safe and enjoyable. Make sure you dress in layers to be prepared for changing weather conditions which can vary greatly from when you start your trip to when you return. Wind chill factors experienced along with your moving snowmobile must also be managed to prevent potential effects from frostbite and hypothermia. Most importantly, always avoid cotton materials in all your clothing layers since cotton can get wet and freeze and does not wick moisture away from your body, drastically reducing your comfort and safety. Layers of clothing you wear underneath your snowmobile suit are crucial to staying safe and feeling comfortable while riding. On cold days, layers can provide a barrier from cold, wind chill, and frostbite. If you have too many layers on you can always remove some during your trip, but if you don't put enough on before you start, you can't add more later. The first layer should be a polyester or synthetic-blend long underwear bottom and top that allows your body to breathe. This layer should be lightweight and not tight or restrictive. A couple of light layers add better protection than one heavy layer. Cotton should never be worn as the first layer—or as any layer—since it does not wick moisture created by perspiration away from your body, does not dry quickly, and therefore stays wet and/or freezes. Polyester blends, silk, or other synthetic blends are recommended because they dry quicker and wick moisture away from the skin. Fleece, wool, or polyester tops and bottoms are the best choices while cotton sweatshirts, t-shirts, jeans, long underwear, and socks should never be worn. Snowmobile suits are specially designed for warmth and comfort while riding. They generally consist of a jacket worn over a pair of insulated bibs or pants. The main purpose is to protect you from the cold, wind chill and frostbite. The outside shell of your apparel should be windproof and waterproof. Acrylic, Gore-Tex or other synthetic materials are the most popular fabrics used in snowmobile suits. Do not wear cotton jackets, bibs or pants since they can become saturated with water from the snow and freeze. Ski apparel can sometimes be an acceptable substitute for a snowmobile suit as long as it is windproof and waterproof and fits loose enough to allow free movement when riding the snowmobile. Riders who regularly snowmobile on ice may want to consider special snowmobile suits equipped with a built-in approved floatation device. An approved helmet is a critical piece of headgear and should be worn at all times when riding a snowmobile. It can help keep you warm as well as protect you from serious head injuries in the event of a crash. Always ensure your helmet fits snugly and have the helmet's strap tightly fastened under the chin when you're riding to achieve full protection. A helmet should be replaced after being involved in a significant impact or after being used for a significant number of years since its ability to absorb impacts deteriorates over time. 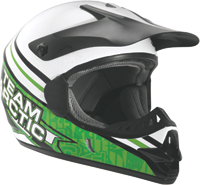 Four basic types of helmets are commonly used by snowmobilers: Full face helmets are the warmest since they completely cover the face and provide a chin guard; they also have a full visor to protect your face and eyes from wind and cold. Open face helmets provide the same protection from head injuries but do not have a chin guard to help protect the face; they have a full visor that flips down to shield the eyes but allows wind to enter the helmet from below the visor. Modular helmets are the newest type of helmet; they combine full-face and open-face features giving riders ultimate protection along with greater visibility and flexibility for changing conditions. Motorcycle-style helmets provide protection from head injuries while allowing more ventilation and air flow in aggressive riding conditions; they require goggles to be worn since they typically do not have a built-in visor for eye protection. Facemasks can be important to have on very cold days to prevent frostbite. If your helmet is not full-faced, a facemask is a must. If not normally worn when riding, a facemask is always important to have stored in a pocket in case the weather becomes very cold. Balaclava facemasks made of thin polyester, silk, or other synthetic fabrics are lightweight, less bulky, more comfortable, and often preferred over knit stocking cap facemasks. Eye protection is essential and may include a helmet visor, goggles, and sunglasses. They protect the eyes from tree limbs, snow and ice kicked up from other snowmobiles, flying debris, as well as protect your eyes from watering from the wind and cold. Goggles, sunglasses, or visors with colored lenses for bright days are indispensable to prevent snow blindness. Amber, yellow, rose, blue or other colored lenses can be very useful during cloudy, late day, or other 'flat light' times by helping to reveal dangerous depressions in the snow. However, clear lenses are essential for riding after dark. Proper gloves are an essential part of your riding gear. Your gloves should repel water and wind to help keep your hands warm. 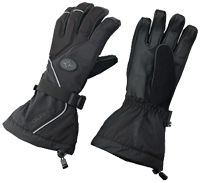 Gloves with a gauntlet which extends over the wrist, above the cuff of your jacket sleeve, provide an extra degree of wind protection. Fleece or wool glove liners, worn as a layer with regular gloves, can help adjust to colder or warmer weather since you can always add or remove the liners. Some choose mittens, which can be the warmest, to protect their hands. Always ensure that your gloves or mittens allow your hands to operate the snowmobile's controls freely. It's a good idea to always carry an extra dry pair with you to change if needed. NEVER wear cotton socks! Good sock choices include thin nylon, polypropylene, fleece, wool, silk, or synthetic blends. Non-cotton socks are best for keeping a warm insulating layer on your feet since they help wick moisture away from your skin. When you feel your feet beginning to get cold it's time to change your socks, so always carry an extra pair with you to change when needed. Good winter boots are very important for making your outing enjoyable by keeping your feet warm, comfortable, and protected from snow and water. 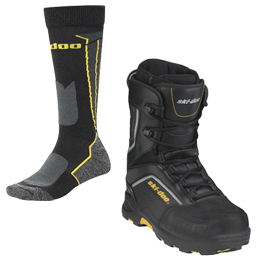 The best boots for snowmobiling use a combination of materials that includes a rubber, waterproof bottom with good lug sole for traction; a synthetic upper that fastens and is high enough to repel snow; and a breathable liner made of wool, fleece or synthetic material that wicks perspiration away from the foot. Be sure your boots do not let any water in, but also allow your feet to "breathe" or let out moisture. Choose boots that provide support and are comfortable for a long day of riding. They should fit well and not feel tight or restrictive since tight boots can cut off circulation and cause your feet to become cold more quickly. Always make sure the insides of your boots are completely dried-out between trips.